Nevern castle sits, an earthwork with traces of masonry walls and deep rock cut ditches, on a spur above the valley of the river Nyfer. It overlooks the church of St Brynach with its early Christian crosses and was once centre of the cantref and medieval lordship of Cemais. In the 12th century the Norman lord Robert FitzMartin and later his son William FitzMartin ruled the barony of Cemais from this castle. In the 1190’s the castle was part of a bitter family feud between the Lord Rhys and his sons, after the Lord Rhys had captured the castle from his son in law William FitzMartin in 1191. The Lord Rhys was subsequently captured and imprisoned in this castle by his sons in 1194, before the castle was demolished in 1195 by the Welsh to ensure it did not fall into Anglo-Norman hands. Geophysical survey and annual seasons of excavation at this castle since 2008 have revealed and initial early 12th century (1109-35) earth and timber castle with massive motte, banks and ditches. After a period of abandonment the castle was refortified (1171-1191) by William FitzMartin with towers, internal buildings and curtain walls constructed from slate mortared together with clay. These form the largest collection of 12th century buildings in West Wales. The basement of the round tower, constructed on top of the earlier motte, almost certainly formed the prison in which the Lord Rhys was confined. These are the first buildings which can confidently be associated with this powerful Welsh prince. In 2011 a gateway to the late 12th century castle was uncovered in the southern corner of the site. The threshold to the castle contained slates with patterns and images incised into them – a unique 12th century apotropaic deposit protecting the castle and its occupants from the forces of evil, recently published in the Archaeological Journal Vol. 169. The lack of later construction on this site means that it has been possible to recover a large volume of detailed information on the construction of, and life in, a 12th century castle. 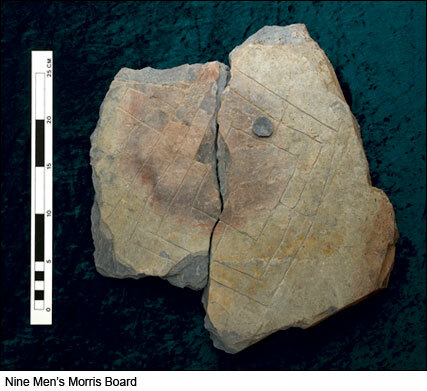 This is exemplified by two Nine Men’s Morris boards and associated counters from stratified 12th century deposits. Summaries of excavation work have been published in British Archaeology November December 2009 and 2016 and Medieval Archaeology Vol. 55, 326-334. More detailed reports of the results of the excavations are available in the pdf files listed below. These excavations at Nevern by Dr Chris Caple follow on from his major excavations at Dryslwyn Castle (1980-1995) published in 2007; Excavations at Dryslwyn Castle 1980-95, Society for Medieval Archaeology Monograph 26. 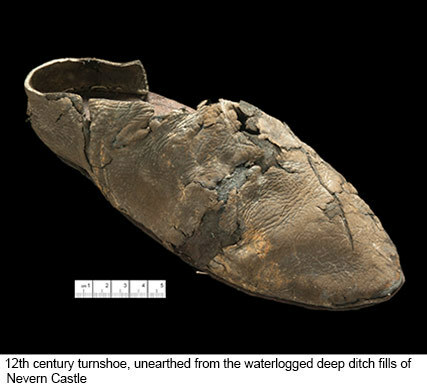 It showed what the sustained detailed excavation of a well contexted and well dated site could achieve in providing detailed evidence about the development of, and life in, a 13th century castle in Wales. The final season of excavation at Nevern Castle will take place at in the summer of 2018, after which the process of writing up the excavation 2008-2018 will begin. It is planned to produce a guidebook to site within a year; the full monograph publication of the full excavation report will follow a few years later.